Happy Saturday everyone.. It's time for our Feature Day at Your Next Stamp and this month it's all about "Little Ones". The Design Team have created some cute Baby themed cards and some little cards. 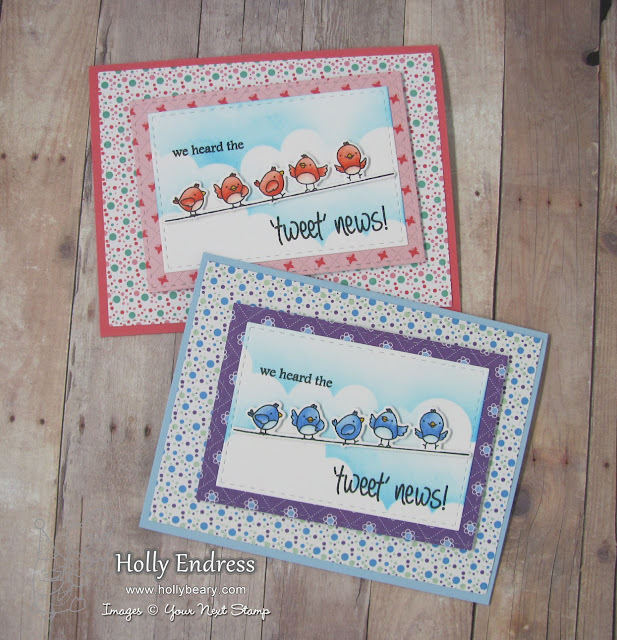 I went with some Baby Cards.. Or you could use them for just Congratulations too! I stamped the images from the Tweet News set onto some Copic friendly card stock using YNS Black Olive ink and then I colored them in with my Copics in colors to match the Just for Fun 6x6 Papers I used. Once the images were colored I used the coordinating die cut and cut them out. For the background I die cut the large Puffy Cloud from the Puffy Cloud Die set from some heavyweight card stock and then I used an ink blending tool and some YNS Blue Curacao ink. I die cut the panel with a small Stitched Rectangle and stamped the sentiment from the same set using the Black Olive Ink. Then I adhered the birds with some foam adhesive. I die cut some coordinating patter papers from the Just for Fun pad with the Stitched Rectangles as well as the image panel and adhered them all to A2 size card bases. There is a white stitched panel on the inside with Congratulations stamped on it. This is a fun set to use for Birthday's or Congratulations. Head over to the YNS Blog for more inspiration from the team and leave a comment while you are there for a chance to WIN a stamp set of your choice! 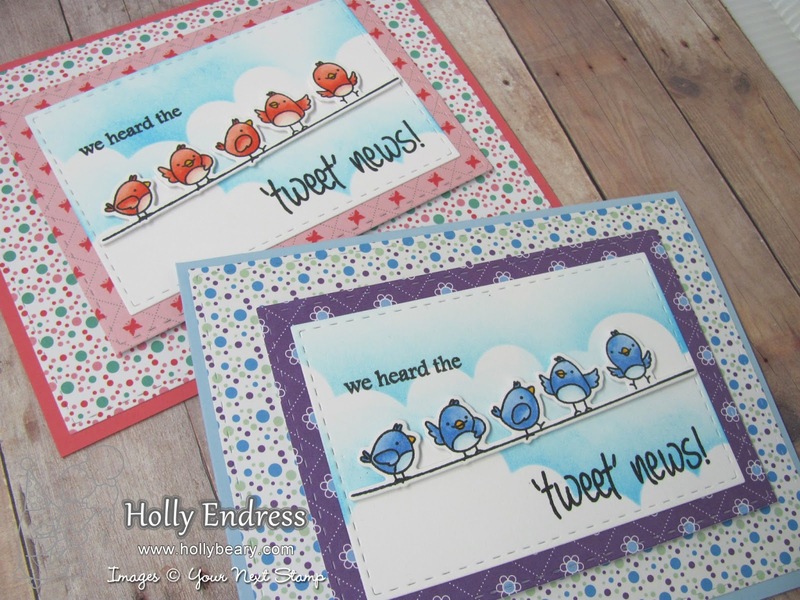 Such sweet cards Holly, the background papers and colours are beautiful and really set off the images. WOW Holly, these are absolutely beautiful. I love how you used the dp and sponged your sky for these little tweets.